One of the most daunting parts of the rebuilding process (for me) is furnishing the house. While the insurance company has paid for the contents of our house, and the funds are sitting in the bank, it is not in my nature to spend money on the magnitude required to furnish a whole house all at one time. And that is effectively what we have to do. Furnish the whole house, save a few bed frames and the restored dining room furniture. Selecting paint proved to be the first big hurdle. In my process, I started with the walls to set the tone for furnishings and finishings. My “plan,” if we can call it that, is to select fairly basic and neutral furniture and use pillows and curtains to add accent, color, and flair. As for knickknacks and artwork, that will come later and organically. I really don’t think we can capture who we are with a collection from a typical store. But as we see things we like, we’ll add those most personal touches. So I set off to Pittsburgh Paint for a color wheel (that’s who our builder uses), and gathered the chips from Sherwin Williams, Glidden, Restoration Hardware, and Behr which made up our old house. And I went to Home Depot for two 8’x4′ sheets of drywall, wall texture, and paint brushes. And 24 quarts of sample paint later, (accrued over about a half-dozen trips to PP) we have a palate. James and I have also made a couple of trips to High Fashion Home here in Houston, which is a mecca of home design – for fabric and more recently for furniture too. I am grateful to have a willing and uber-capable mother-in-law at the ready to sew whatever is needed – bedding, pillows, curtains (a.k.a. 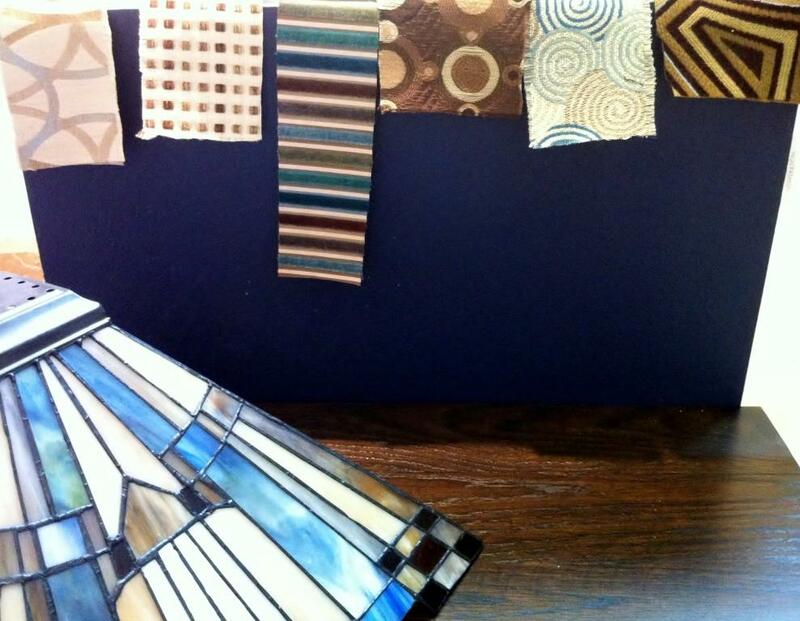 window treatments), etc. If we buy the parts and prioritize the projects, she’ll make it happen. *And I’d like to note for the record that sometimes the lighting in pictures does funny things to the paint, so some may seem brighter in pictures than they are in reality! Fabric on left is for chair cushions. Calico Corners, style: treat, color: pumpkin. 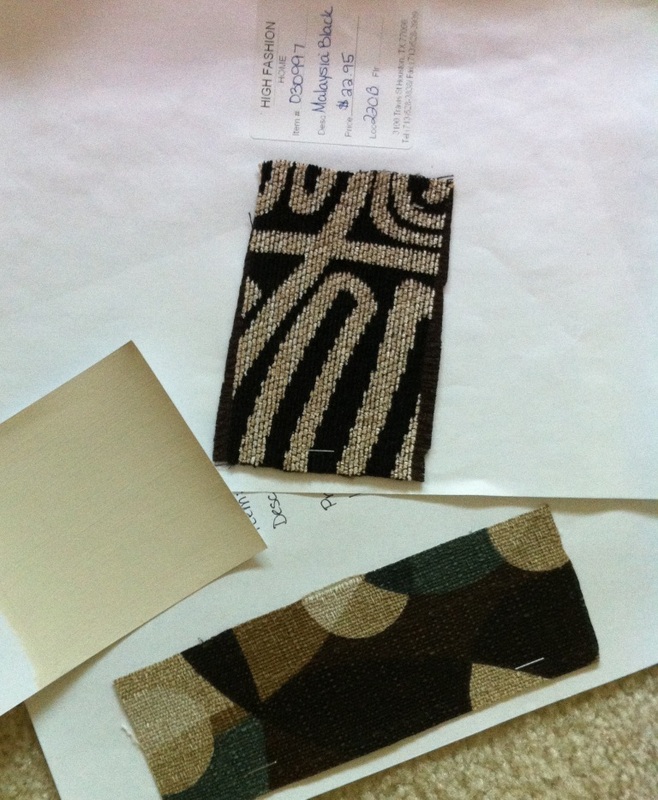 Fabric on the right is for window treatments. High Fashion Home, item: 039238, description: theo marble. The Parlor (aka. living room). 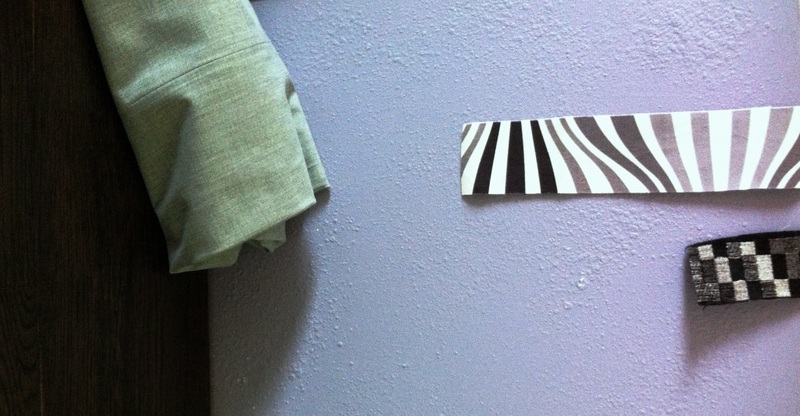 The paint is Purple Surf (444-5). 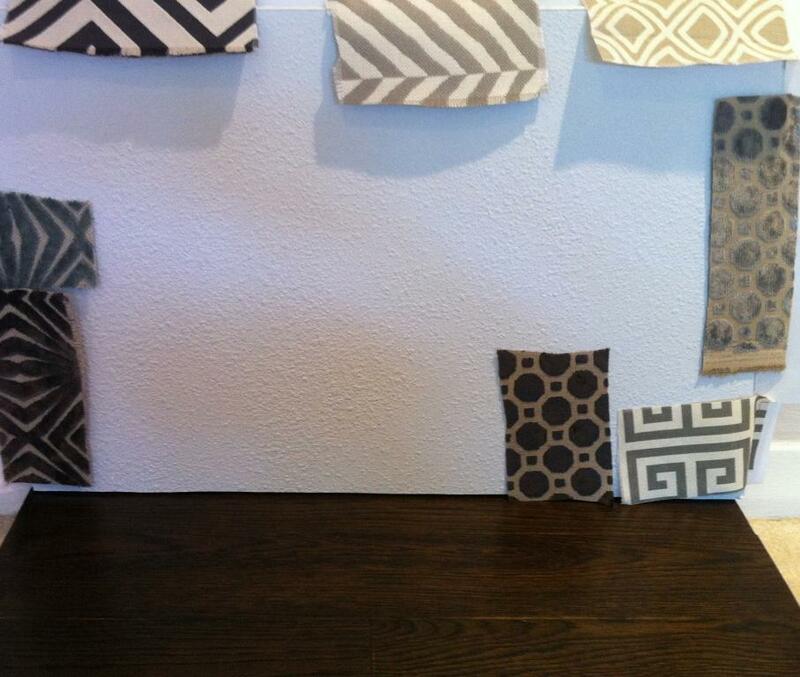 The fabric on the left is for accent pillows. High Fashion Home, item: 039547, description: crawford charbrown. The fabric on the right is also for accent pillows. HFH, item: 036645, description: touchdown black (NLA). The gray fabric on the bottom is the general color we’re aiming for for the couch and chairs. Kitchen / Breakfast / Family Room / Entry / Staircase paint color: Aster Petal (347-2). And as you can see we have lots of fabrics to pick from but no firm idea yet. The furniture in the family room will likely be charcoal/graphite. Wall color: Victory Blue (447-7). Again, lots of fabrics to select from, but I think we’ll be going with a neutral cream color for the bedspread and chairs, and then use a combination of those fun fabrics for accents. In the front left is the lamp shade to our nightstand lamps (Inglenook Tiffany Table Lamp). Bottom of picture has the restored window treatments from James nursery, which include a deep red stripe. We may re-purpose these, or we may go with something new. The walls will be Pittsburgh Paint “mocha,” which is our base paint selection for the whole house. 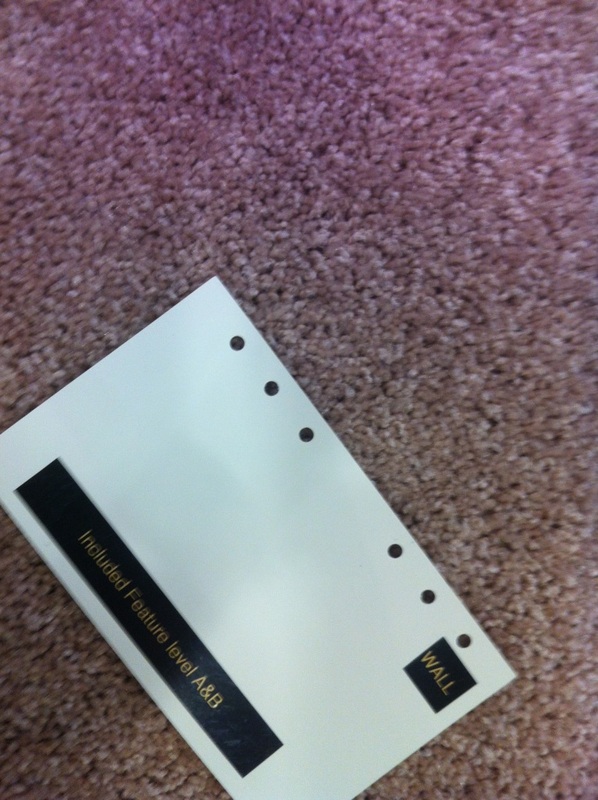 Fabric on the top for pillows: HFH, item: 030997, description: malaysia black. Fabric on the bottom, for giant window seat pillows: HFH, item: 035197, description: kaleidoscope gypsy/denton. Furniture in here will likely be chocolate and the darkest blue shade from the kaleidoscope pattern. Fabric on the left, curtains. 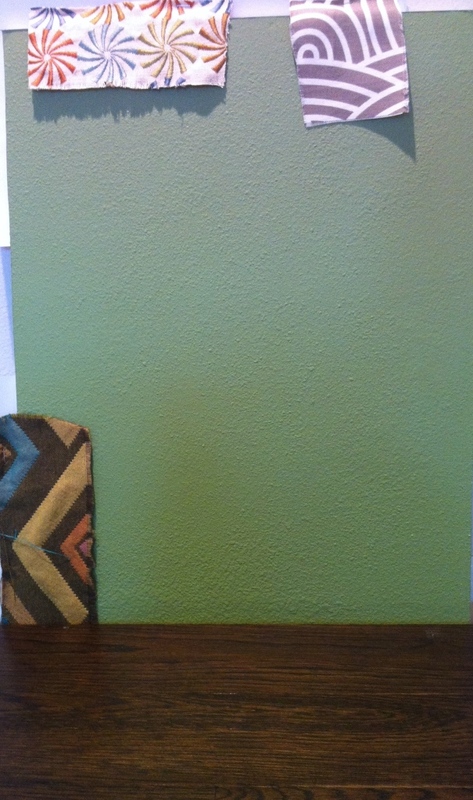 Calico Corners, style: claude, color: tri-color. Fabric on top, duvet cover. Calico Corners, style: kellam, color: amethyst. 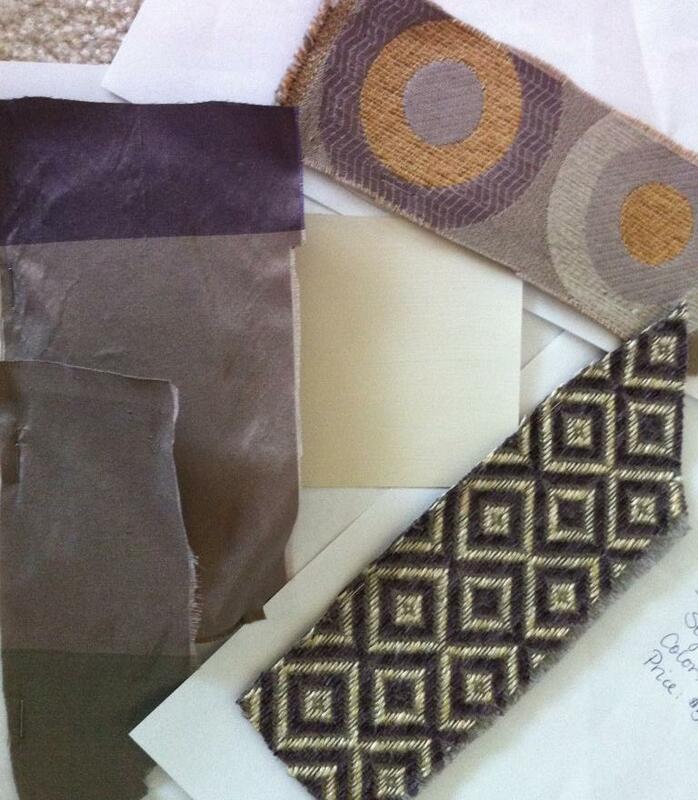 Fabric on the right, accent pillows & trim. 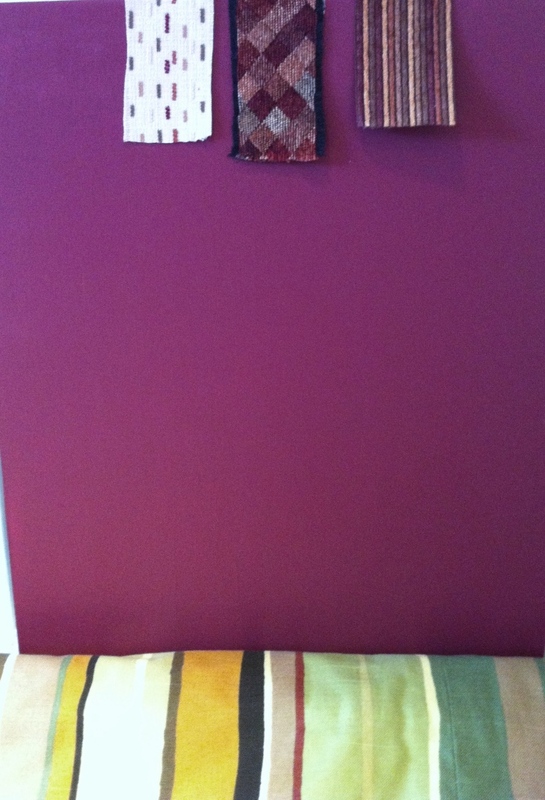 Calico Corners, style: astrella, color: plum. We have a brass capped metal bed frame for this room that we will paint in a mix of metals. Main wall color (on the left) is Animation (450-6). 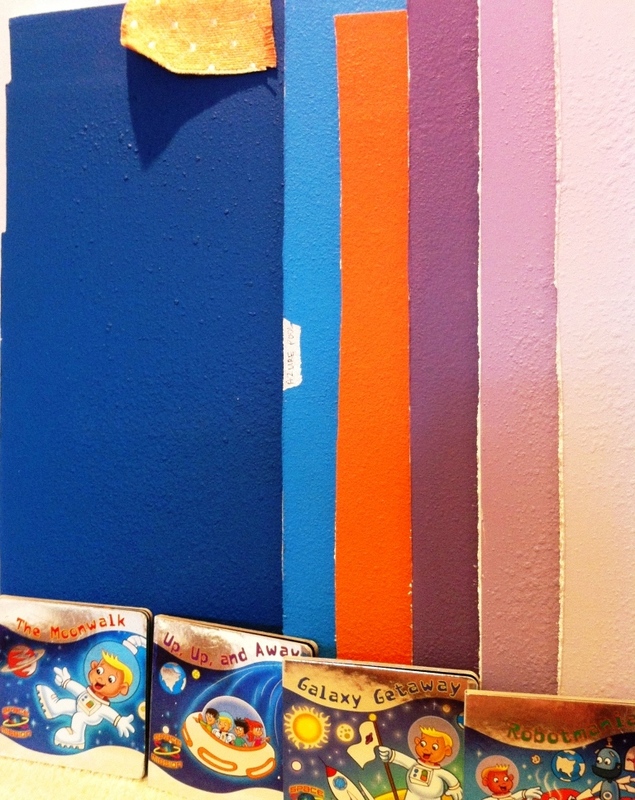 The hope is that we will use the books pictured at the bottom as inspiration for a space-themed wall mural, utilizing many of those test colors that didn’t make the cut. It’s crazy ambitious but…Chris’s mom and sister have lots of artistic talents so I am hoping they can help me turn this vision into a plausible reality!